Colorado Division of Aeronautics is excited to announce the kickoff of the Colorado Airport Sustainability Program. This is a “first of its kind” project that will provide tools and guidance for Colorado general aviation airports to develop sustainability plans for their own facilities. Information contained on this page will help to explain in detail the Colorado Airport Sustainability Program's background, initial case studies, the project's mission, and a tentative schedule. The purpose of the Colorado Airport Sustainability Program is to provide guidance and resources to general aviation airports in Colorado in order to help airports prepare their own individually customized sustainability plans. The Colorado Airport Sustainability Program will result in three completed sustainability plans for three pre-selected case study airports: Centennial Airport, Rifle-Garfield County Regional Airport, and the Fremont County Airport. These case study sustainability plans will provide a valuable resource as a reference for other airports when developing their own unique plans. The overall goal of the Colorado Airport Sustainability Program is to provide Colorado general aviation airports with a tool that will assist in addressing ways to improve sustainability within economic, social, operational, and environmental realms at their airports. Sustainability is to maintain and enhance the long-term viability of Colorado's general aviation airports in a way that properly balances economic, social, and environmental pressures while still meeting the operational needs of an airport. However, because each airport has varied needs, the scalability and flexibility of the definition of sustainability can mean that one airport defines sustainability differently than another. A holistic approach to managing an airport so as to ensure the integrity of the Economic viability, Operational efficiency, Natural Resource Conservation and Social responsibility (EONS) of the Airport. Sustainability in public works, in the broadest sense, means delivering our services in a manner that ensures an appropriate balance between the environment, the community and our ability to pay. It can be thought of as the three Ps – People, Planet and Profit or the three E’s – Equity, Environment and Economy. It means being thoughtful about our decisions and it means pursuing a balanced approach for a vibrant community today and tomorrow, and is accomplished by the efficient delivery of services and infrastructure in an environmentally and socially responsible way that ensures the best economic choice in the long term. The mission of the Colorado Airport Sustainability is to provide the support and resources necessary to enable an airport’s viability over the long-term. From revenue generation to reduced utility bills, maintenance costs to life-cycles, the Colorado Airport Sustainability Program will help general aviation airports preserve and enhance the ability of general aviation airports to remain viable now and in the future. Because each general aviation airport in Colorado has varied needs, the most important goal for the Colorado Sustainability Program is to provide tools that are APPLICABLE and USEFUL for Colorado's entire system of public-use GA airports. Three case study airports will showcase how a range of different airports, in size and in available resources, can successfully benefit from sustainability. Ultimately, the Program will result in a tool kit that all GA airports can use to create and implement a sustainability plan at their own facilities. Division Director, David Ulane reads Airport Day Proclamations during the June 3, 2016 Colorado Aeronautical Board meeting. Photo by Shahn Sederberg. Governor John Hickenlooper declared June 1, 2 and 3, 2016 as Fremont County Airport Day (1V6), Rifle Garfield County Airport Day (RIL), and Centennial Airport Day (APA), respectively. 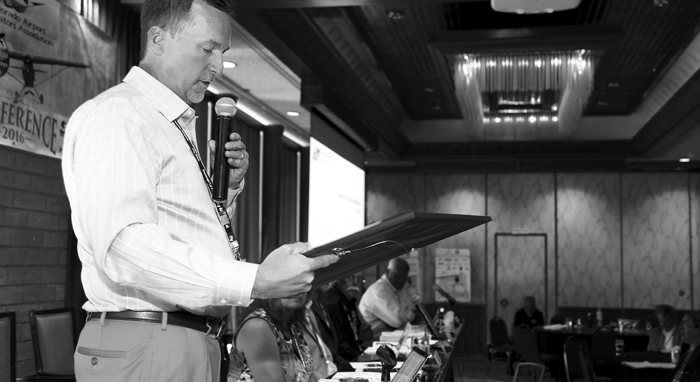 The Governor's Proclamations were read by Division Director, David Ulane at the June 3rd, 2016 Colorado Aeronautical Board (CAB) Meeting in Durango, CO. The June CAB meeting was held in conjunction with the 2016 Colorado Airport Operators Association (CAOA) Spring Conference. Each of the airports were recognized with Airport Day Proclamations in appreciation for their participation in the initial roll-out and implementation of the Colorado Sustainability Program. The Colorado Sustainability Program is the nation's first program of its kind designed to assist Colorado general aviation airports to become more environmentally, financially, operationally, and socially sustainable transportation facilities. Each proclamation commends the staff, management, and supporters of each airport facility for their dedication and commitment to their airports, communities, and the entire Colorado aviation system. Download the following FAQ sheet here. What are the benefits of creating a sustainability plan for my airport? For airports, sustainability provides a framework to address an increasingly complex and competitive aviation industry in a manner that reflects individual airport needs. Airports are finding that sustainability makes good business sense because it saves money and builds strong relationships with tenants, neighbors, and regulators. By adopting sustainable practices, airports can save money while improving operational efficiency, protecting the environment, improving the airport user experience, supporting employees, and stimulating economic growth. The principles of sustainability for airports are often defined by the acronym EONS, which stands for Economic Viability, Operational Efficiency, Natural Resources Conservation, and Social Responsibility. The Airport Sustainability Plan Tool Kit (Tool Kit) is built into the CDOT Aeronautics Web Based Information Management System (WIMS) that is also being used for grant management, so you can get started on your airport’s sustainability plan right away. The Tool Kit comes pre-loaded with some of your airport’s data to help you build your sustainability plan. Beyond these data, you will need some additional information to complete your airport’s plan. Ask your CDOT planner for a helpful checklist that outlines the information to have at hand before you begin. Does it cost anything to create an airport sustainability plan? No. This is a free Tool Kit provided by CDOT Aeronautics that was developed in part using grant funding from the Federal Aviation Administration (FAA). Do I need specialized knowledge or skills to create my plan? No. The Tool Kit was developed to walk you through creating your plan step by step. All you need is some basic knowledge of how your airport operates and some data about these operations. Any key terms or calculations are explained in the Tool Kit and you can download a Tool Kit Manual if you want to refer to or print the steps and instructions. Yes. While the Tool Kit includes some pre-loaded information about your airport, each section offers you options for customizing your data as well as your mission statement, goals, and initiatives. Are there examples of plans available from other airports? Yes. The Sustainability Tool Kit was developed with assistance from three pilot airports – Centennial, Fremont County, and Garfield County – who prepared sustainability plans using the Tool Kit. Their feedback was used to refine the program for the rest of Colorado’s General Aviation airports. How long will it take to create my sustainabilty plan? First, you will need to gather specific airport data to enter into your baseline Profile. It will take approximately 1 to 2 hours to gather the data you need to get started. Using this information, you will select a Mission Statement, Goals, and Initiatives. The three test airports averaged from a few hours to two days to complete their plans. Depending on your level of specificity and the number of goals and initiatives you select, your effort could be shorter or longer than this average completion time. Who gets to see my data and the results? Is my data private? Once you complete your airport sustainability plan in WIMS, CDOT Aeronautics will review it and send you a Microsoft Word® file that you can refine and finalize. With your sustainability plan stored in WIMS, only the CDOT Aeronautics Staff and your airport will have access to your plan. Should you choose to share your plan, let your CDOT planner know, and it can be placed on the CDOT Aeronautics website. Remember, the more airports that share their plans, the greater the collective awareness and impact. What do I get when I finish my plan online? Once your plan is complete, you will be able to print out a copy to share with your airport staff, users, and community. The plan will include your specific set of implementation steps, timelines, and responsible parties to help you achieve your goals. In the Dashboard tab, the Tool Kit will provide a number of graphics based on your progress to include in presentations and outreach for your plan. Your customized sustainability plan offers an opportunity to promote your airport’s efforts to continuously improve and support your community. Am I required by the the Division of Aeronautics to use the Tool Kit? No. At this point, there is no requirement for your airport to use the Tool Kit. It is, however, strongly encouraged for the benefits to your airport. Your airport’s plan will help you address social, financial, operational, and environmental goals and will prompt action and measurement of progress. Having a completed sustainability plan could also help better position your airport to apply for future grants and pursue other funding and support opportunities. What guidance is available to help me through the process? The Welcome tab of the Tool Kit provides online guidance to help you through the process for creating your customized airport sustainability plan. There is also a guidance manual that provides more detailed instructions on how to move step-by-step through the Tool Kit. Finally, if you still have unanswered questions, contact your CDOT planner. What if I don't have all the information to include in the Profile? The Profile represents the existing conditions and operating characteristics of your facility. You can add both quantitative and qualitative data to define the baseline of your airport. Try to fill in as much data as possible. If you do not currently have the data, leave the fields empty, start tracking those data to include for your next airport sustainability plan. What are Focus Categories? How many should I include in my Airport Sustainability Plan? Focus Categories are broad areas of interest on which your airport will focus with regard to sustainability. Focus Categories included in the Tool Kit include Revenue Generation, Expense Reduction, Economic Development, Operations and Maintenance, Asset Management, Business Operations, Energy, Water, Waste, Climate/Air Quality, Natural Environment, Community, Airport Users, Employees, and Noise. You should consider selecting four or five Focus Categories for your plan. Be sure to include a Focus Category from each EONS area. How many Sustainability Goals should I select? You should select enough Goals to cover the potential opportunities in your Focus Categories, but not so many that they become overwhelming. Start by identifying two to three Sustainability Goals for each of the four to five Focus Categories that you select. For each Sustainability Goal, you should have either quantitative or qualitative associated baseline data. What is a Sustainability Initiative? How many should I include in my Plan? Initiatives are the actions that will help you reach one or more Sustainability Goals. They can comprise a new program at the airport (i.e., employee training) or changes to operations/maintenance (i.e., lowering the thermostat in the office) at your airport. You should select at least two Initiatives for each Sustainability Goal in your plan. This is a comprehensive Tool Kit User's Manual that will give you the necessary guidance to produce an effective Airport Sustainability Plan for your facility.